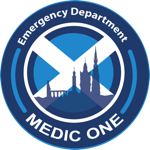 Edinburgh Emergency Medicine - Recruitment for February 2015 underway. Join the ED team! Recruitment for February 2015 underway. Join the ED team! We are looking for enthusiastic, fun-loving doctors to join the Emergency Department teams. Emergency Medicine may or may not be your choice of career but if you want a 6 month taster then apply now! A six month job in Emergency Medicine will give you a chance to develop your practical skills, widen your knowledge base and become a real team player. The skills and experiences you will get during the six months are transferable to all areas of clinical care. They will be invaluable in your future career. We are currently recruiting to LAT posts at the Royal Infirmary of Edinburgh and St John’s Hospital, Livingston. For an informal chat about the posts and which would suit you best then please contact us via the website. Applicants wishing to work LTFT will be considered. Closing date for applications is 18th December 2014. We look forward to welcoming you onto the team.